[159 Pages Report] The global offshore decommissioning market is estimated to be USD 5.91 billion in 2017, and is expected to grow at a CAGR of 5.05%, from 2017 to 2025. Maturing oil and gas fields and aging offshore infrastructure will drive the offshore decommissioning market. This research study involved the use of extensive secondary sources, directories, and databases, such as Hoover’s, Bloomberg BusinessWeek, Factiva, and OneSource, to identify and collect information useful for a technical, market-oriented, and commercial study of the global offshore decommissioning market. Primary sources are mainly industry experts from core and related industries, service providers, environmental, regulatory and authority bodies, shipbroking and charter service providers, standards and certification organizations of companies, and organizations related to all the segments of this industry’s value chain. The points given below explain the research methodology. After arriving at the overall market size, the total market has been split into several segments and subsegments. 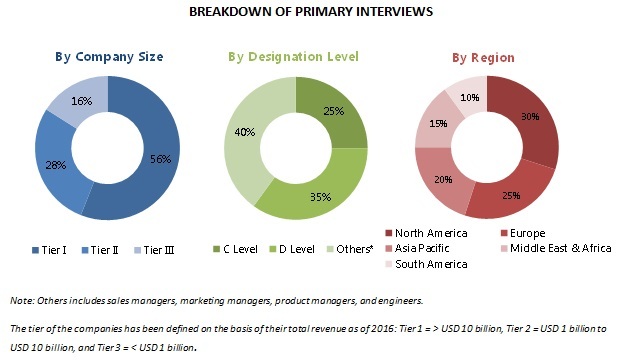 The figure given below illustrates the breakdown of primaries, on the basis of company type, designation, and region, conducted during the research study. The ecosystem of the offshore decommissioning market consists of oilfield operating companies, service providers for different type of services. The figure below shows the market ecosystem along with the major companies. The decommissioning service providing companies that provides project management, platform preparation and removal, transportation services includes Amec Foster Wheeler Plc (U.K.), Aker Solutions ASA (Norway), Ramboll Grooup (Denmark), AF Gruppen ASA (Norway), Technifmc Plc (France), John Wood Group Plc (U.K.), and Tetra Technologies Inc., (U.S.). 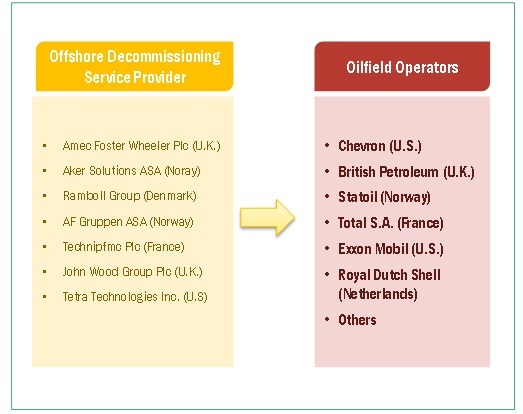 Oilfield exploration and production companies such as Chevron (U.S.), British Petroleum (U.K.), Statoil (Norway), Total S.A. (France), Exxon Mobil (U.S.), and Royal Dutch Shell (Netherlands) among others, are the end-users in the offshore decommissioning market. The report segments the offshore decommissioning market, on the basis of service, into project management, engineering and planning, permitting and regulatory compliance, platform preparation, well plugging and abandonment, conductor removal, mobilization and demobilization of derrick barges, platform removal, pipeline and power cable decommissioning, materials disposal, and site clearance. The well plugging and abandonment segment accounted for the largest market share in 2016, driven by demand from the European market. Well plugging and abandonment accounts for up to 45% of the total decommissioning cost of project. The report also segments the offshore decommissioning market, on the basis of the depth at which decommissioning projects happens, into shallow water and deepwater. The shallow water segment was the largest market and is projected to maintain its edge over the deepwater segment owing to its lower operational costs. However in the future, the deep water segment would compete with shallow water as many platform installations now are at deep water and ultra-deep water depths. In this report, the offshore decommissioning market has been categorized, on the basis of region, into North America, Europe, Asia-Pacific, the Middle East & Africa, and South America. 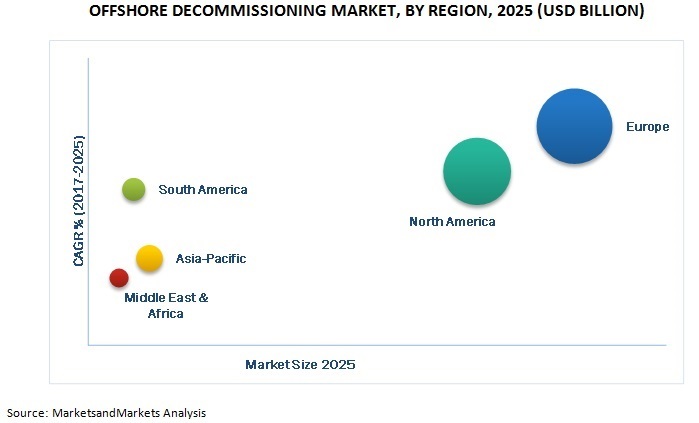 The European market led the offshore decommissioning market, with the largest market share, by value, in 2016, and this trend is projected to continue till 2025. The market in North America will also play an important role in driving demand for offshore decommissioning. The Asia-Pacific market may see higher growth in later years for offshore decommissioning during the forecast period. This growth is due to the increasing focus on rules and regulations in countries like Indonesia, and Malaysia, where huge decommissioning opportunities are available. The high cost of decommissioning work and lack of technology infrastructure and regulatory monitoring are restraints for the offshore decommissioning market. Operating companies are using different decommissioning methods and innovative technologies to lower the decommissioning cost. The availability of oil and gas field life enhancing techniques helps operating companies to postpone their decommissioning work. The leading players in the industry, based on their recent developments and other strategic industrial activities, are Amec Foster Wheeler Plc (U.K.), Aker Solutions ASA (Norway), Ramboll Grooup (Denmark), AF Gruppen ASA (Norway), Technifmc Plc (France), John Wood Group Plc (U.K.), and Tetra Technologies Inc., (U.S.), among others. In terms of growth strategies, market players have been focussing on winning large numbers of contracts & agreements to increase their market size and strengthen their market foothold in the regional market. Many companies which has expertise in nuclear decommissioning projects are also attracted to oil and gas decommissioning seeing the huge market opportunity in North Sea region. There is a mix of both organic and inorganic growth strategies that companies are using to stay relevant in the market. In Europe consolidation is happening through mergers & acquisitions to maintain their financial health and enhance their service offerings. 11.11 Claxton Engineering Services, Ltd.
11.16 Deepocean Group Holding B.V.